You just got your first bike and don’t have any tools for the road? Or maybe you lost your tools and don’t have a spare tool set? You really want to go for a ride, even though the only tool you have is a 10 pound wrench? Go ahead, but be sure to wear your helmet. And when you come back, order a multi tool! You might want to buy the M-19, aka the Crank Brothers Muti 19 Tool. It’s one of the best available bike tools. One of the Topeak ALiEN models (ALiEN II, DX, XS, etc.) would be a great choice, too. I’ve had the Multi 19 Tool for more than six months now. Tried breaking it on multiple occasions, but the thing won’t even bend when using it. It’s very well built, completely made of steel. The Crank Brothers didn’t make any shortcuts with this one. I like the fact that the philips and the flat screwdrivers come in 2 different sizes. I didn’t care much about the carrying case, though. 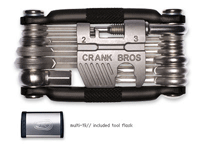 Without it, the Crank Brothers Multi 19 takes less space. And I don’t have to take it out every time I need it. Not that it’s a hassle to do it; I’m just lazy. Being a compact multi tool, the Multi 19 has some shortcomings. The tools are short, and the handle wide. So it isn’t very easy to use in tight spaces. But the important thing is that it gets the job done on the road. Available at Amazon and ChainReactionCycles.com.